For his entire career, Dario Argento has been fighting a two-front war against coherent narrative and audience credulity. 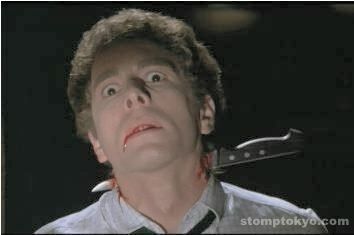 The Italian horror director has always been known for having more style than story sense. His best movies are unforgettable for their visuals, which hopefully helps the audience to forget about the incoherent plot. But in his worst movies it's the plot, or lack thereof, which is most memorable. 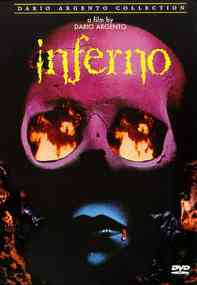 Inferno is probably the earliest Argento film to completely leave story and character behind. It's a semi-sequel to Suspiria, the movie considered by many as Argento's masterpiece. In that film, a ballet school was actually a front for a powerful witch, a witch who was one of "Three Mothers" who secretly ruled the world. Inferno repeats the story of the Three Mothers in some opening narration, and then the pertinent information is exchanged among characters ad nauseum throughout the film -- not that it makes a bit of difference. No matter how much these characters know about the Three Mothers, no matter how obvious it is that their lives are in danger, they just keep doing whatever they were doing until they die. Rose (Irene Miracle) is a writer living in an old building in New York. She buys a book about the Three Mothers (the local antiques dealer apparently has several copies on hand) and quickly figures out that her building may be one of the legendary houses of the Three Mothers. To test this, she does what anyone would do to figure out if they are living in a building of the damned: She breaks into the basement, alone, at night, and noses around. She finds a water-filled hole in the floor and accidentally drops her keys into it. Then she calls the super to fish her keys out and reports the building to the Housing Authority. Oops -- that's what would happen in the real world. 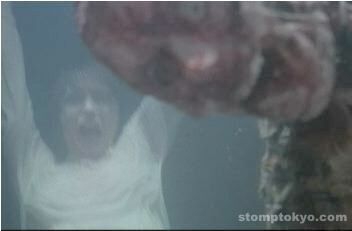 In the movie, Rose dives into the hole to get her keys back. The hole leads to a submerged ballroom, complete with a picture of the Mater Tenebrarum, or Mother of Darkness, though we can't see what she looks like. 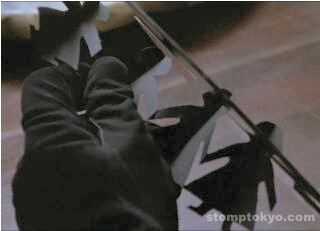 Then Rose bumps into a dead body and flees, observed only by the pair of black-gloved hands that are so ubiquitous in Argento's films. As illogical behavior goes, Rose's fully-dressed, nighttime dive into a strange hole under a building which (she has reason to believe) houses ultimate evil has got to win some sort of prize. Maybe the silver medal, right behind the gold-medal and world-record-setting dive into a dark, maggot-filled hole that Jennifer Connelly took in Argento's Phenomena. (Connelly's dive was made particularly stupendous by the fact that she was lunging after a phone that could have just as easily been pulled out of the hole by its cord, and also the fact that the house -- and the basement to which the hole apparently led -- belonged to a brutal murderer.) But what happens next is even more of a head-scratcher. She stays in the apartment, and apparently never calls the police about the dead body. Why would anyone stay in an apartment when they knew there were dead bodies in the basement? It is New York, maybe it's rent controlled. Oh, so that's what happened to the script.. The story follows a letter from Rose to her brother Peter in Rome, where it is accidentally intercepted by Sara (Eleonora Giorgi), Peter's lady friend and a fellow music student. Peter himself is quite literally bewitched by a mysterious young woman, leaving Sara to follow her own nonsensical plot thread. It isn't until Sara essentially repeats Rose's experiences with the discovery of the Mothers (a pointless exercise that does nothing but waste half an hour of screen time) that Peter reappears. Peter finally gets the letter from his sister and travels to New York, only to find that no one knows where she is. Desperate to find something out, Peter begins hanging with the Baronness Elise Van Adler (Daria Niccoldi), a rich friend of Rose's with an absent husband and a mysterious illness. Much walking around, opening doors and peering into vents continues until basically the end of the movie, interrupted only by the occasional brutal killing. "I'm never watching the Naked Chef again!" 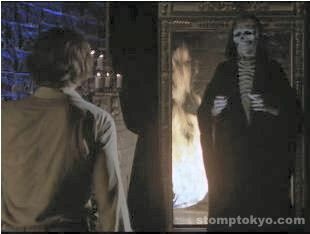 One of these death scenes is so bizarre and so disconnected from the rest of the film that it demands we take special notice of it. Next to the evil building there is a bookstore, and the proprietor is an old man on crutches who hates the neighborhood cats. He hates these cats so much that he has a bag full of strays he's caught, and in the middle of the night he goes to what is presumably supposed to be Central Park to drown them in a pond. After he fusses with the bag he manages to get it to go under, but he falls in himself. Then he gets swarmed by rats (sample dialogue: "Oh my God, rats are eating me"), the natural avengers of cat deaths. This goes on for a while, and then a portly hot dog vendor runs around the lake with a knife and cuts the bookseller's throat with a knife. Huh? Were the rats and/or the hot dog vendor possessed? Neither had a connection to the building so it's a little unclear. Maybe the Italians just think that's just a day in the life of a New Yorker. What exactly Argento hoped to accomplish with Inferno isn't clear; few of the plot threads are explored, and even fewer of the mysterious goings-on are explained, especially where Peter is concerned. Twice he is dragged off by agents of evil, apparently to his doom, and twice he pops up again as if nothing has happened. The idea that the apartment building in New York was built to house ultimate evil is reiterated again and again, but we never learn of anything particularly evil happening to anyone other than those people who find out about the building and dare to investigate. The final reveal, which could have been a masterpiece of practical and optical effects work, is botched at the last minute by an ineffectual costume. Added to an ineffectual script, it's a blow from which the film really can't recover. Though Inferno is universally praised for its inventive cinematography and spooky atmosphere, we found it more boring than anything else. The most aesthetically pleasing, well-groomed, artistically-lit bump on a log in the world is still just a bump on a log, although Inferno might have been improved by the inclusion of a few log bumps.